Olive oil is great for frying. Olive oil is naturally stable under heat and has a smoke point that is high enough for most types of cooking. Because it is more expensive than other cooking oils, many people ask us if it can be re-used after frying. The answer is yes, you can reuse olive oil. Researchers conducted a study where food was fried in olive oil and found that olive oil was stable even when reused 10 times. They concluded that for frying foods, olive oil maintains quality and nutrition better than seed oils. Let the oil cool and then filter it through a couple of layers of cheesecloth, a fine meshed sieve, a paper coffee filter or even paper towels. The objective is to remove the little fried bits that remain in the oil. These food particles can burn when reusing oil so remove them as best you can. Store the oil in an appropriately sized container. You want the oil to fill the jar, leaving little room for air in the container. A dark colored bottle, a glass jar, or opaque stainless steel container are good choices. We do not recommend that you store the oil in metal containers other than stainless steel. Copper and brass can react with the oil. You can even reuse the bottle the oil came in. Make sure the bottle is tightly capped. Store the oil in a cool, dark place like in your pantry. Do not store it near the stove or in the light. Heat and light will accelerate the oxidation of the oil. Use the oil quickly. Label the oil with the date and what you fried in it. 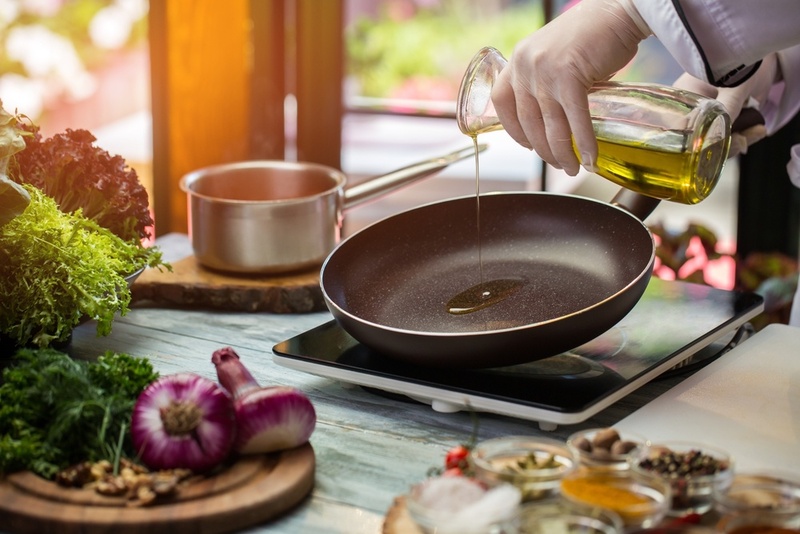 Cooking oils retain some of the flavors of the food. You don't want to fry doughnuts in oil you used for fish! Take a minute to write yourself a quick reminder. Reuse the oil only for cooking. Use fresh oil for dressings and marinades. Depending on what you have fried in it, you can reuse the olive oil up to 5 times. Discard the oil when it becomes dark in color or changes viscosity. When you discard the oil, don't pour the oil down the drain. Oil may clog your plumbing. If you can, recycle it. If you intend to reuse your frying oil, keep these tips in mind when frying. As with all frying, make sure that the oil reaches the correct temperature before adding your food and do not allow the oil to burn. A thermometer is a helpful accessory for frying. Avoid letting water get into your frying oil. Avoid ice around frozen foods, and do not use a lid when frying to prevent condensation from dripping into the oil. Oil with water in it will prevent the food from becoming crisp when frying. Plan ahead by frying neutral tasting foods in the oil when it is fresh and stronger flavored food in the oil when you are reusing it.